A major study by the Rockefeller Foundation found that 68% of the customers who quit buying from their regular suppliers do so because employees fail to communicate effectively with those customers. Efficiency experts claim that at least 40% of the average worker's time is spent doing tasks that are either unnecessary or have to be done over because they were not done according to instructions. So, as you can see, the ability to communicate with precision has a tremendous impact on the bottom line. One way to communicate precisely is to put it in writing. Executives can multiply their influence by learning the techniques of forceful writing. High-powered writers learn to focus words the way a laser beam focuses light. Focus your objective. What is the purpose of the material you want to write? Writing can help you achieve the five I's: It can inform, inquire, influence, instruct and incite. Focus your audience. Written materials such as reports and brochures can be valuable positioning tools. They should be written with a specific audience in mind -- the audience you wish to influence to buy your products or services. Focus your organization. A good piece of writing flows like a symphony. Organize your material so that each topic flows easily and naturally into the next. Focus your clarity. Some writers think they can hide fuzzy thinking by burying it under a mass of words. To have impact, ideas must be expressed precisely and concisely. Lincoln's Gettysburg Address required only 275 words, and 196 of them were of one syllable. Focus your refinement. Perfection rarely emerges from a first draft. Ambrose Bierce once said that "a saint is a dead sinner revised and edited." Great writing is rough copy revised and edited. Be your own toughest editor, but don't stop there. Let others read what you have written before you submit it to your audience. You know what you meant, but you can't know how others might interpret it until others have read it. -It gives the reader a benefit . -It produces a desired response . *Technique Number One: Get your thinking straight. All communication begins with thoughts. In fact, thoughts are the vehicles through which you communicate with yourself. Before you communicate your thoughts to the outside world, take time to organize them. Think about the things you want to say. What is the most important point? What facts, data or arguments do you need to support this point? Organize your points in the order of importance, along with supporting points. Then decide upon an effective, attention-getting introduction. Next, present your material in order of importance. Conclude by summarizing the material or telling your readers how you want them to respond to it. * Technique Number Two: Write what you mean. Write exactly what you mean. In face-to-face communication, the speaker can receive immediate feedback from the listener. In written communication, the feedback is not immediate. In fact, you may receive no feedback. So you must get your point across accurately the first time, or your communication is futile. * Technique Number Three: Get to the point . If you're writing a letter to ask for an appointment, ask for it in the opening paragraph. If you want more information, request it. If you want someone to buy something, ask for the order. * Technique Number Four: Be concise. Don't waste words. Keep sentences and paragraphs short and simple. Always use the shortest, most familiar words. Don't endeavor when you can try. Don't finalize when you can finish. Don't utilize an instrument for manual excavation when you can dig with a shovel. To quote Winston Churchill, one of the great masters of language, "Short words are best, and the old words when short are the best of all." * Technique Number Five: Be real. Each of us has a personality, a blending of traits, thought patterns and mannerisms -- which can aid us in communicating clearly. Be natural, and let the real you come through. Don't try to write like a Harvard scholar unless you really are one. Don't try to imitate street language unless it comes natural to you. * Technique Number Six: Use images. A picture is worth a thousand words. 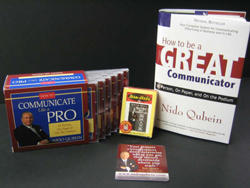 My book, How to Be a Great Communicator: In Person, On Paper & On the Podium, devotes a whole section to the skillful use of images. Why the emphasis? Because we think in images, or mental pictures. A good example is the line that once divided the Communist world from the Free World. It was just another political boundary until Churchill called it the "Iron Curtain." That gave it a powerful image that made clear its true nature. When you have an abstract idea you want to express, try to think of something familiar to liken it to. Make sure it's familiar to you and to your audience. One writer, explaining the workings of a nuclear reactor, likened the nucleus of an atom to a rack of balls on a pool table, ready to fly apart when struck by a speeding cue ball. Instructors in problem-solving like to compare knotty problems to logjams, which can be broken by finding and releasing the key log. Communication is not a nice-to-have skill. It is essential to success in the business world. To produce and market the products and services to support the billions of people who now inhabit the earth requires a level of communications undreamed of in previous centuries. When the quality of your product depends upon the collective efforts of dozens, hundreds or thousands of individuals, communication becomes the lifeblood of your enterprise. In fact, communication is at the heart of everything we do. It is the foundation for interaction among human beings. Communication has to do with meanings, with understandings, with feelings, with desires, with needs and with ideas. Our world is filled with information. But the greatest need is for understanding -- for building bridges between human beings so we can better live together, work together, get along with each other, and make this earth the best possible home for the human race.